Balao Class Submarine: Laid down, 21 April 1943, at Cramp Shipbuilding Corp., Philadelphia, PA.; Launched, 14 May 1944; Commissioned USS Moray (SS-300), 26 January 1945; Decommissioned 12 April 1946, at Mare Island Navy Yard, Vallejo, CA. ; Laid up in the Pacific Reserve Fleet, Mare Island Group; Redesignated Auxiliary Research Submarine (AGSS-300), 1 December 1962; Struck from the Naval Register, 1 April 1967; Final Disposition, sunk as a torpedo target, 18 June 1970, off San Clemente, CA. 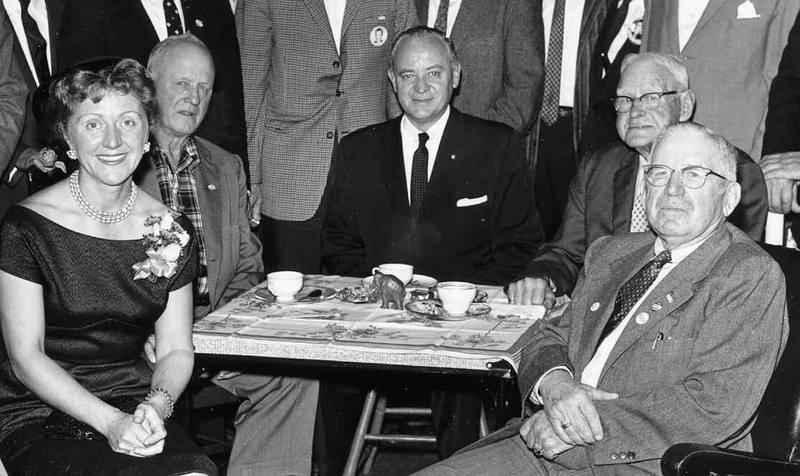 in 1970 Moray received one battle star for World War II service. Specifications: Displacement, Surfaced: 1,526 t., Submerged: 2,424 t.; Length 311' 8"; Beam 27' 3"; Draft 15' 3"; Speed, Surfaced 20.25 kts, Submerged 8.75 kts; Cruising Range, 11,000 miles surfaced at 10kts; Submerged Endurance, 48 hours at 2kts; Operating Depth Limit, 400 ft; Complement 6 Officers 60 Enlisted; Armament, ten 21" torpedo tubes, six forward, four aft, 24 torpedoes, one 5"/25 deck gun, one 40mm gun, two .50 cal. machine guns; Patrol Endurance 75 days; Propulsion, diesel-electric reduction gear with four Fairbanks-Morse main generator diesel engines, 5,400hp, Fuel Capacity 94,000 gal., four Elliot Motor Co., main motors with 2,740 hp, two 126-cell main storage batteries, two propellers. 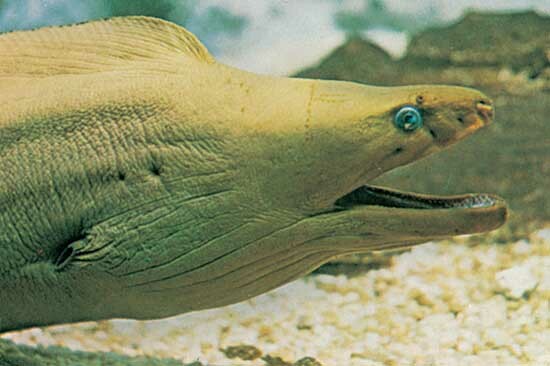 37k Green moray Gymnothorax funebris. Photo by Carleton Ray, courtesy of answers.com. 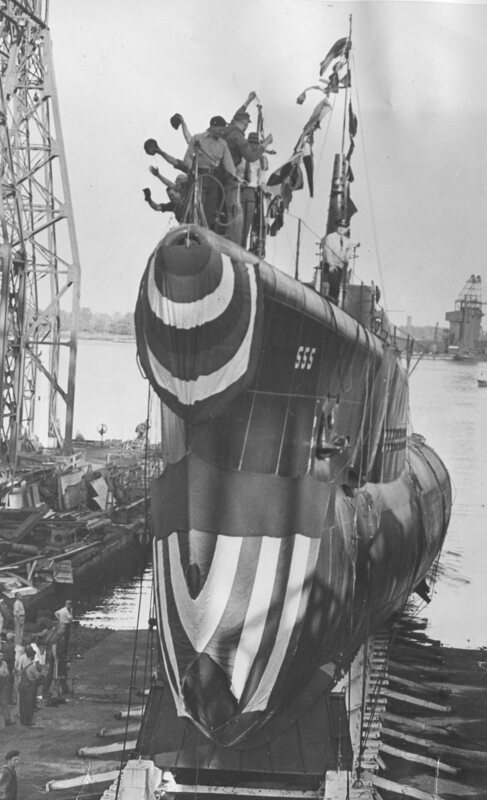 539k Moray (SS-300) was sponsored by Mrs. Styles Bridges, wife of the New Hampshire Senator; 14 May 1944 at Cramp Shipbuilding Corp., Philadelphia, PA.
57k Preparing the Moray (SS-300) for launch at the head of the ways, 14 May 1944 at Cramp Shipbuilding Corp., Philadelphia, PA. Courtesy of Harry Kholer, son of Harry F Kholer, EM1c, Plankowner Moray (SS-300). 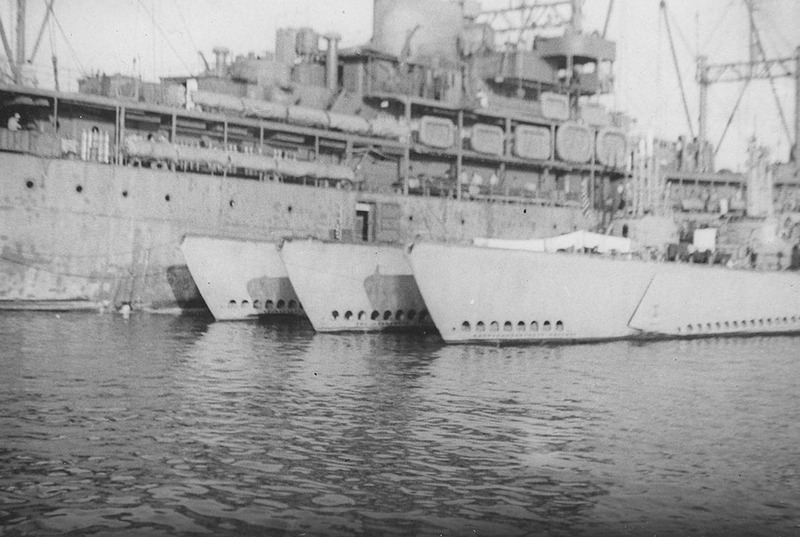 472k A tip of the hats from deck personnel aboard the Moray (SS-300), numbered 555 on her hull, moments before the boat starts down the ways, 14 May 1944 at Cramp Shipbuilding Corp., Philadelphia, PA. The numbers on their side are undoubtedly an internal construction number used by Cramp. Simon Lake also used in-house numbers on his O & R class boats while they were still in his yard. 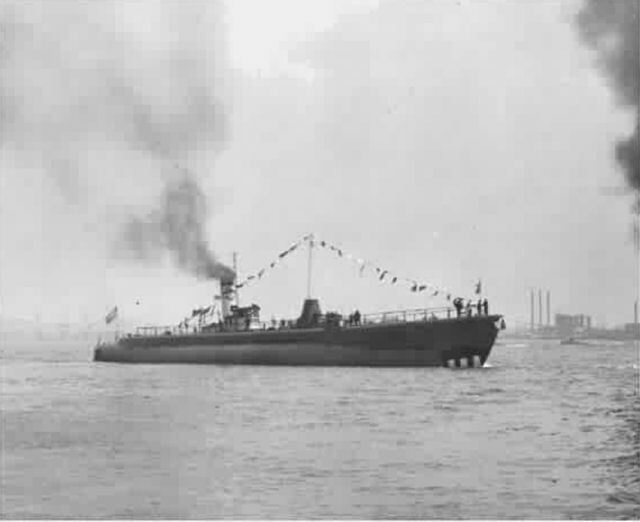 61k Bedecked with signal flags and bunting, the Moray (SS-300) slides down the ways into the Deleware River, 14 May 1944 at Cramp Shipbuilding Corp., Philadelphia, PA. The inscription on the border of the photo says ""Best Regards" Fitz (Thomas A. F. Fitzpatrick, Principal Inspector) F.L. Barrows ( CO) J.R. Zullinger (XO) R.F. Stroup (LT) & R.E.M. Conwell (LT)". Courtesy of Harry Kholer, son of Harry F Kholer, EM1c, Plankowner Moray (SS-300). 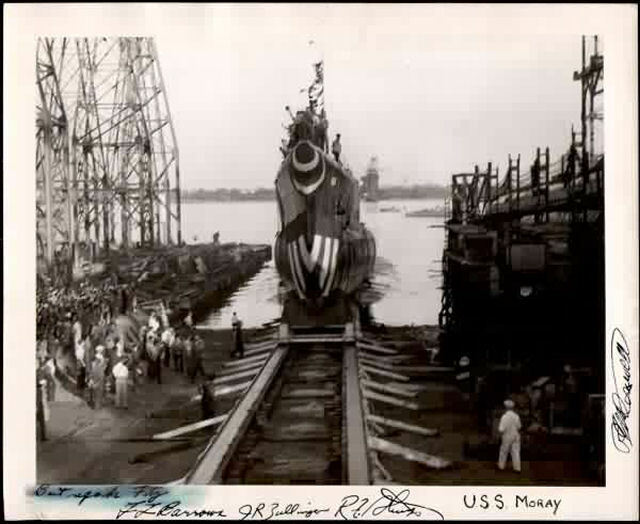 31k Moray (SS-300) is waterborne on the Deleware River, 14 May 1944 after her launching at Cramp Shipbuilding Corp., Philadelphia, PA. Courtesy of Harry Kholer, son of Harry F Kholer, EM1c, Plankowner Moray (SS-300). 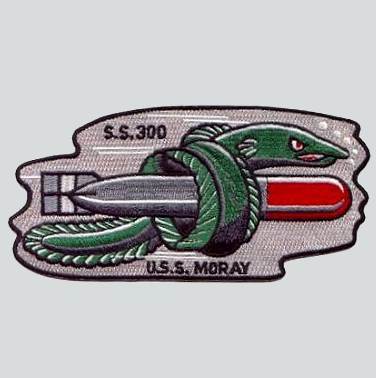 18k Battle Emblem of the Moray (SS-300), designed by Phyllis Kholer Longley, 4 November 1944. Courtesy of Harry Kholer, son of Harry F Kholer, EM1c, Plankowner Moray (SS-300). 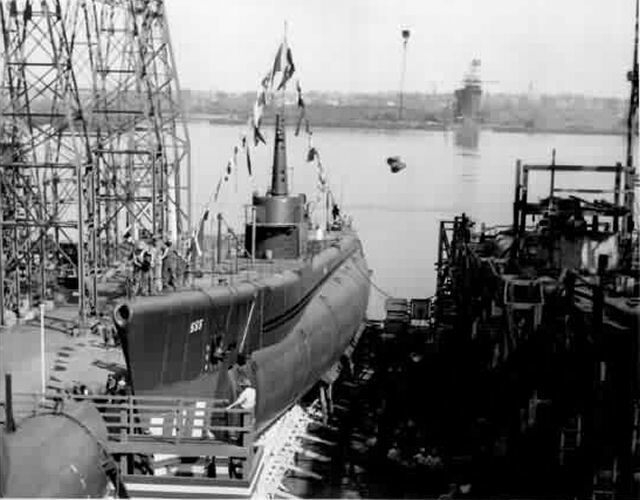 56k Port side view of the Moray (SS-300), fitting out in Philadelphia shortly after her launch, 1944. 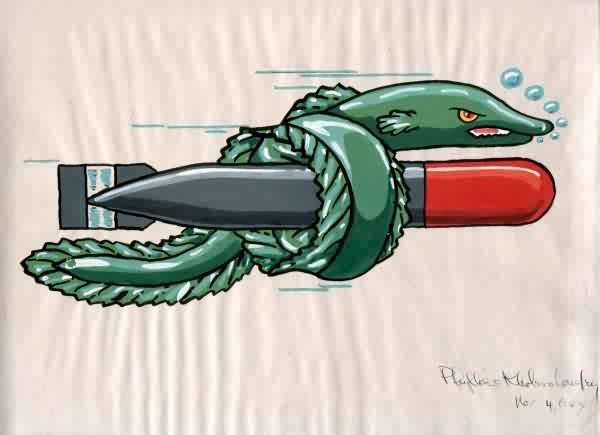 Courtesy of John Hummel, USN (Retired). 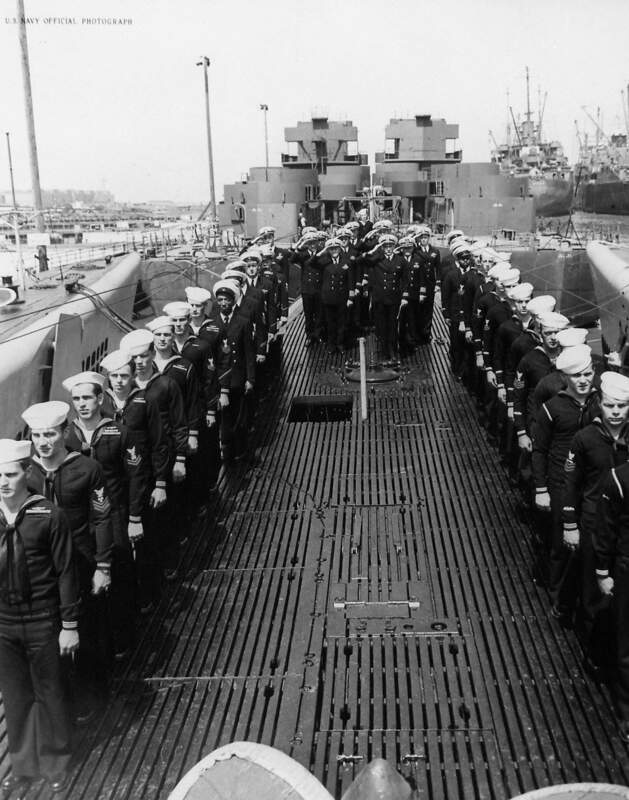 266k Officers salute as the colors are lowered on Batfish (SS-310) at the end of her decomissioning ceremony at Mare Island on 16 April 1946. 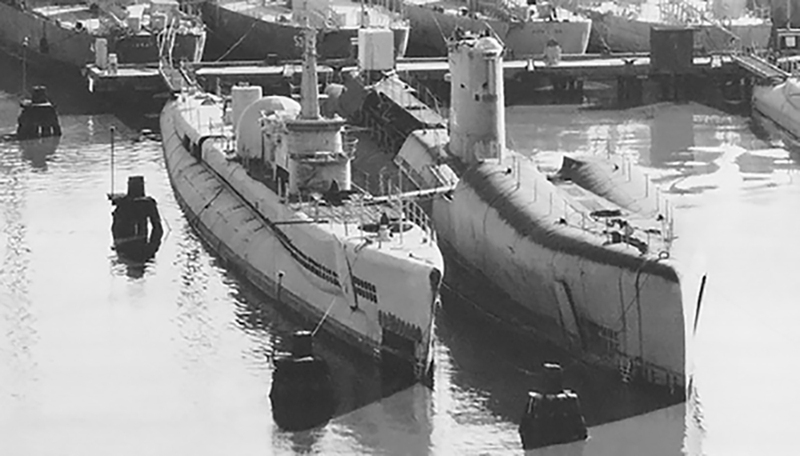 Moray (SS-300), is to the left; incomplete destroyer escorts Ely (DE-309) and D. W. Halsey (DE-310) are forward await scrapping; Eurayle (AS-22) and Pelias (AS-14) are to the right. USN photo # 1504-46, courtesy of Darryl L. Baker. 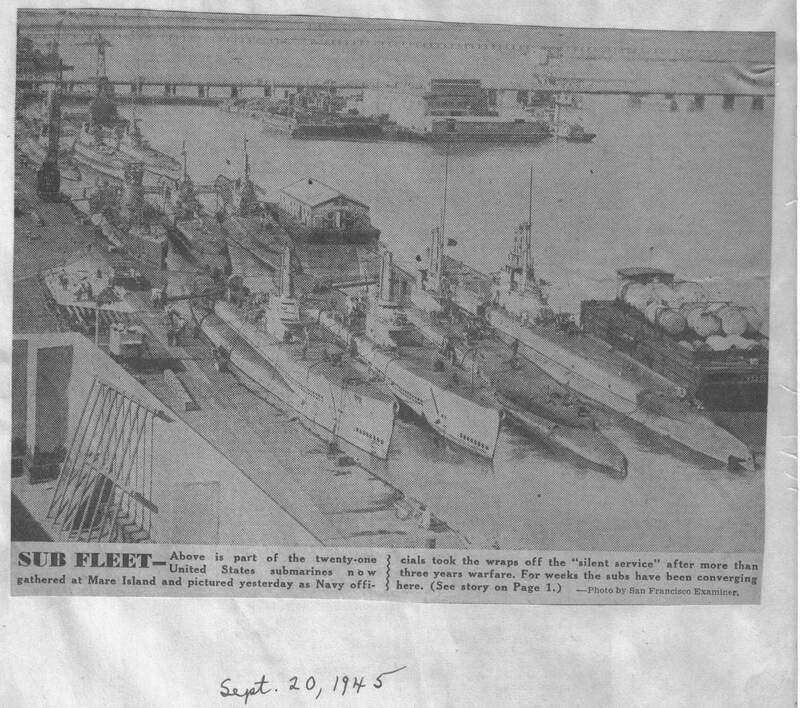 197k The submarine tender Griffin (AS-13), at Midway with three of her charges between 26 August and 1 September 1945 The three boats are not identified, but boats at Midway at that time included Piranha (SS-389), Lionfish (SS-298), Moray (SS-300), Devilfish (SS-292),and Hackleback (SS-295). The outboard boat is an EB boat, but none of the above boats are EB boats, all Cramp or Portsmouth-built, so they are unidentified for now. USN photo from the collection of CWO 4 Benton E. Buell, USN, courtesy of David Buell. 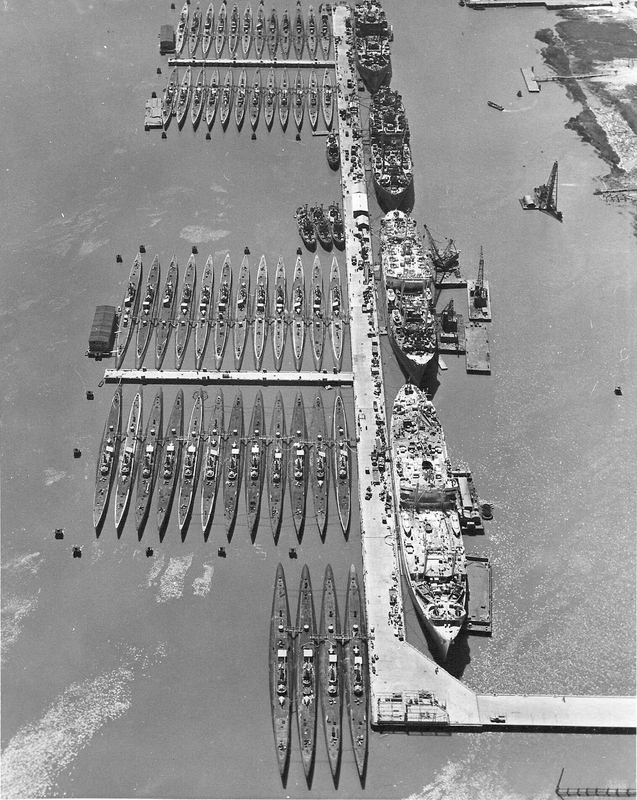 2.80k Photo of the Reserve fleet at Mare Island, circa January 1946. There are 52 submarines and 4 Sub Tenders in this photo. Whether coincidental or on purpose, the number of boats in the photo is the same as that which were lost in WW II. 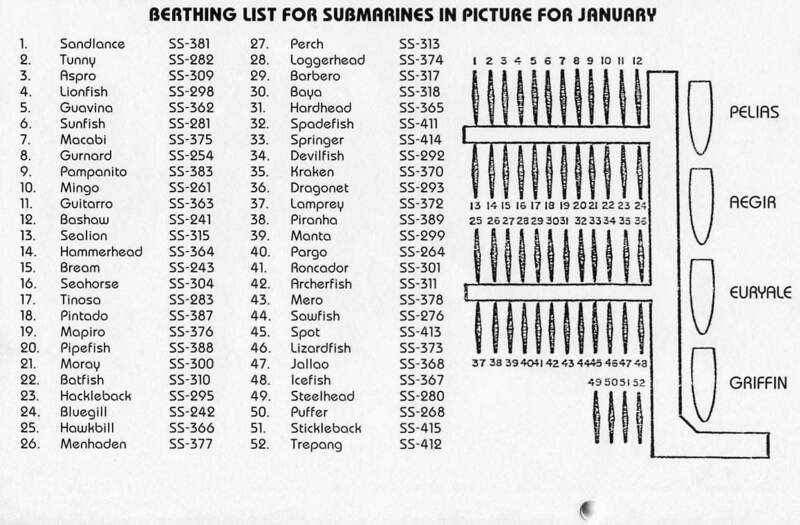 Photo commemorating 50 years, U. S. Submarine Veterans of WW II 1996 calendar, courtesy of James P. Marion, III. 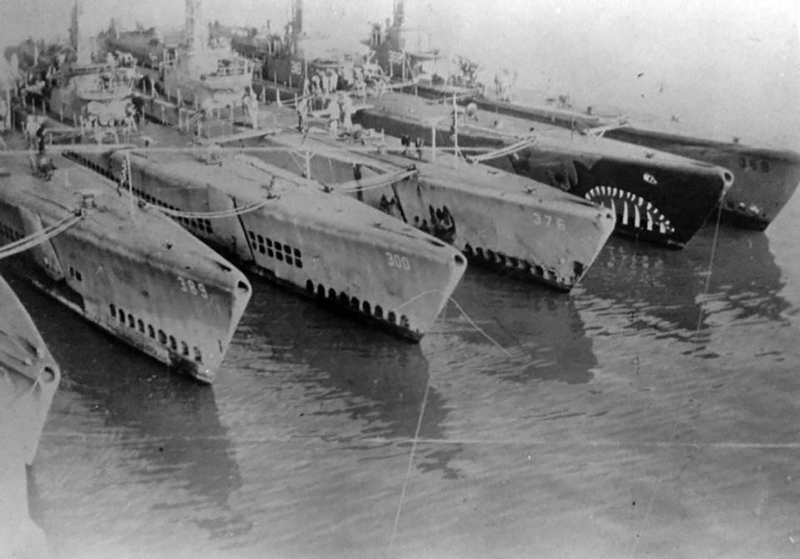 368k Post war predator photo of Piranha (SS-389), Moray (SS-300), Mapiro (SS-376), Baya (SS-318) & Jallao (SS-368). USN photo courtesy of subasepearl.com. via Ron Reeves (of blessed memory). 239k Moray (SS-300) & Grayback (SSG-574) at Mare Island, 1966. Photo courtesy of John Hummel, USN (Retired). 169k Moray (SS-300) in color as she sinks. Photo courtesy of John Hummel, USN (Retired). 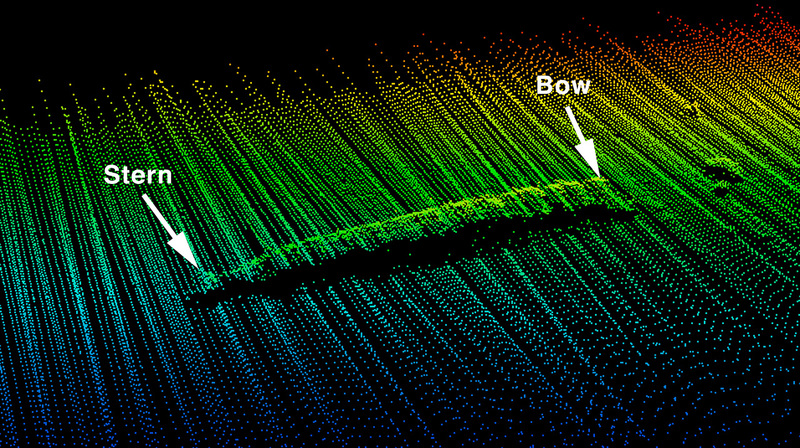 841k 3D point cloud of ex-Moray (SS-300). The image shows Moray resting on her starboard side on a gradual slope at San Clemente Island, CA. Maximum depth at the stern is 200 ft. Data from 2002 multibeam sonar survey conducted by USNS John McDonnell. Multibeam sonar data provided by the US Navy. Image rendered by Gary Fabian ub88.org. Embedded photo by John Walker. 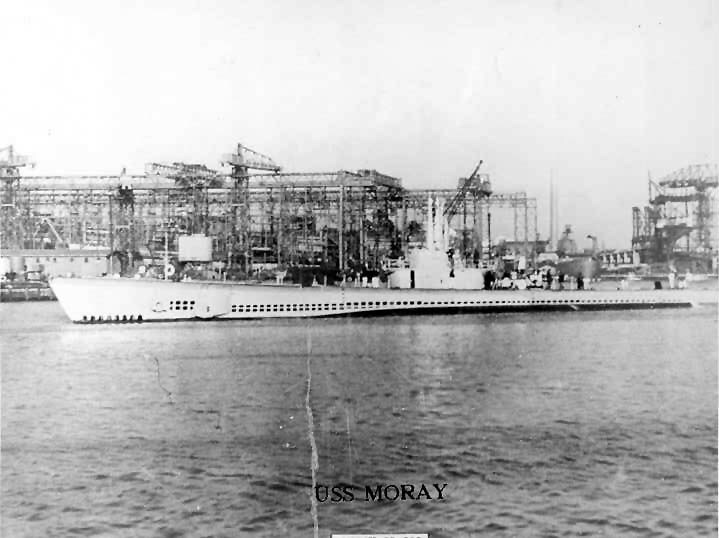 Moray (SS-300) by Harry Kholer, son of Harry F Kholer, EM1c, Plankowner Moray (SS-300) . 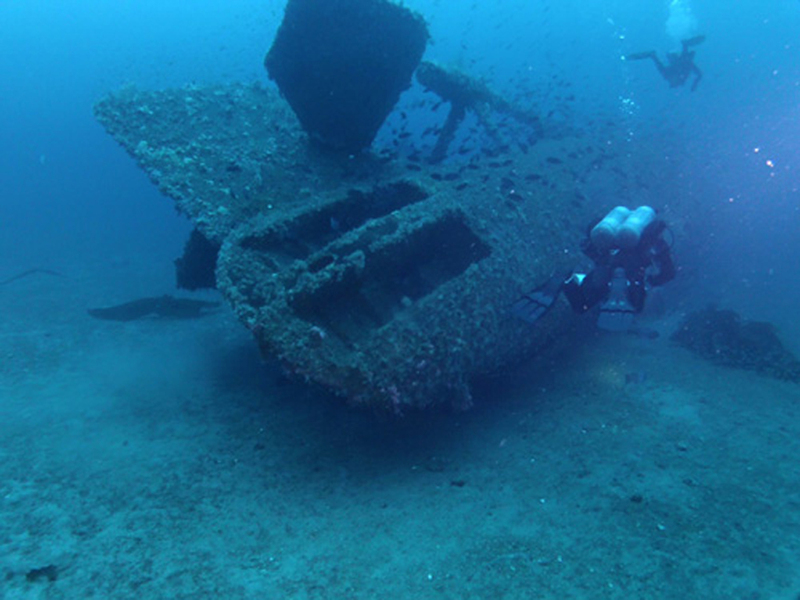 Video and Still Frames EX-USS MORAY (SS-300), San Clemente Island, CA, August 25-26, 2012 By John Walker and Scott Brooks.